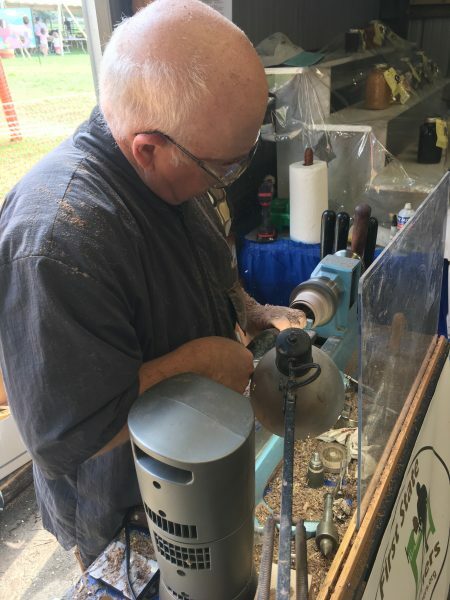 First State Woodturners have a history with the Maryland, Harford County Farm Fair in the area of woodworking. 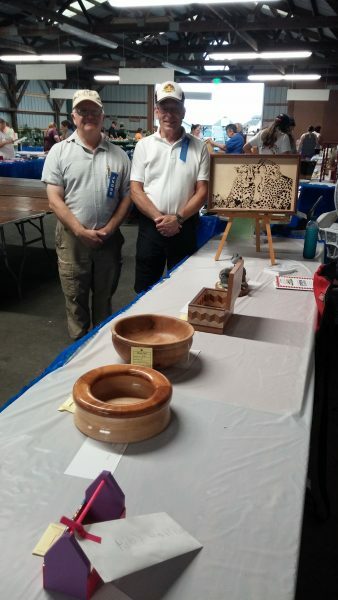 For several years now, Eric L. Krum and Tom Sloan have judged the fairs woodworking entries. 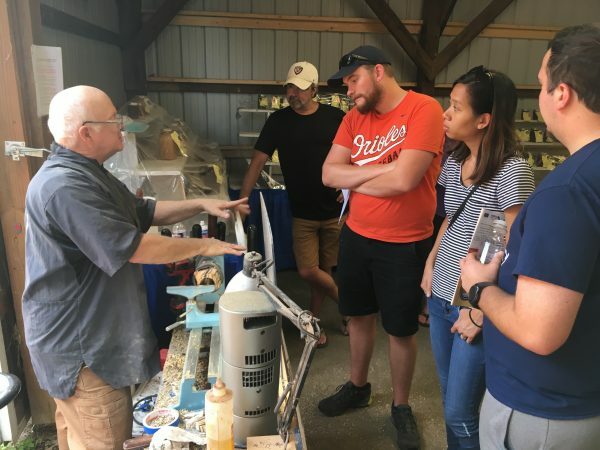 Here is a picture of the two Judges from FSW at the 2017 fair. 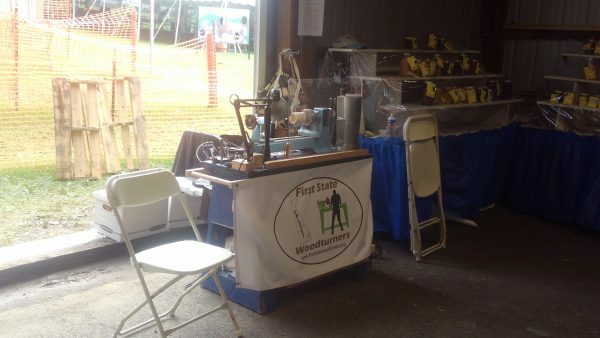 This year the fair asked if the FSW would be interested in conducting a woodturning demonstration during the fair. Eric L. Krum volunteered for the task. 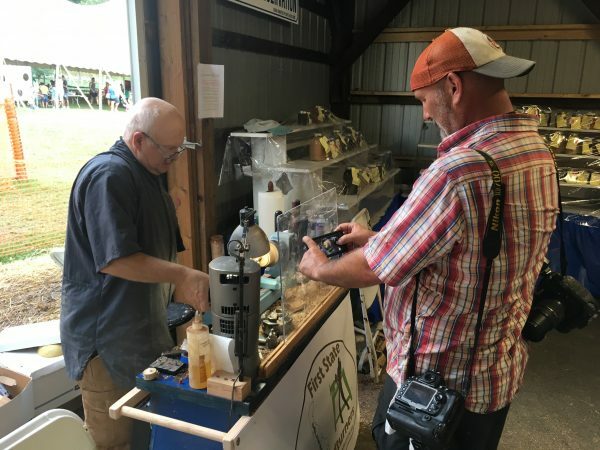 Eric coordinated to pick up one of the clubs lathes purchased with a grant from the American Association of Woodturners (AAW). 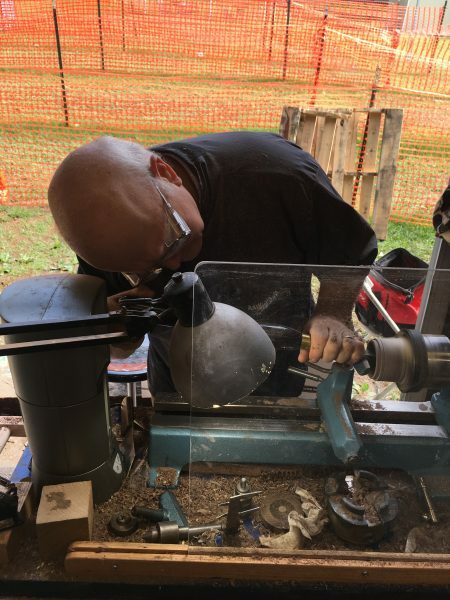 Once getting the lathe, home Eric shortened the legs, added a Plexiglas window to protect observers, and made other enhancements to facilitate the demonstration. 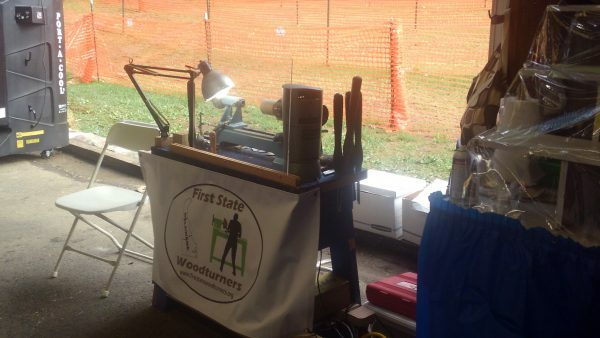 The club banner based, on a graphic by Tom Sloan and Paula Krum, is displayed on the lathe stand. The banner is available to any member for use at a display or demonstration. In addition to demonstrating woodturning Eric displayed some wood samples and his turned wine stopper wood collection. Each wine stopper is made from a different species of wood. The Harford Farm Fair gave us a great place in the Arts & Crafts building to set up. People leaving the fair and wanting to catch the bus to one of the parking lots have to pass by the woodturning demonstration area. There was a lot of interest in the demonstration, both from adults and kids. One of the items Eric developed in preparation for the demonstration was an information sheet on the AAW Chapters in the area. Several people took the sheet. One young lady stated her father lived in Delaware, owned a lathe, but did not belong to a turning club. She thought he would be interested in the information. Future member? Here Eric is turning one of his lidded boxes. 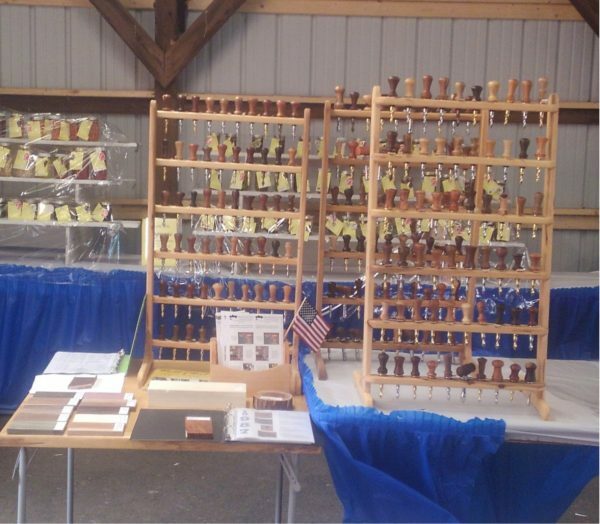 The Blue Mahoe lidded boxes turned during the demonstration were given to the woodworking First Place winners. Here is Eric cleaning up the bottom of the box. Eric L. Krum cleaning up the bottom of the lidded box. There was a lot of interest in the woodturning demonstration.